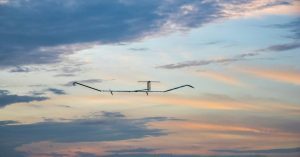 Airbus’ solar-powered aircraft, the Zephyr S HAPS (High Altitude Pseudo-Satellite), recently made its maiden flight and incredibly set a world record in the process. The Zephyr, which runs on solar power and weighs 75 kilograms, is utilized for “local satellite-like services”, and operates in the stratosphere at an average altitude of 70,000 feet with a wingspan of 25 meters. “This very successful maiden flight represents a new significant milestone in the Zephyr program, adding a new stratospheric flight endurance record which we hope will be formalized very shortly,” Jana Rosenmann, head of unmanned aerial systems at Airbus, said in a statement. “We will in the coming days check all engineering data and outputs and start the preparation of additional flights planned for the second half of this year from our new operating site at the Wyndham airfield in Western Australia,” Rosenmann added.